Michigan is an ideal location. As one of the top 5 Christmas tree producing states in the nation, we have the perfect conditions for growing evergreens. 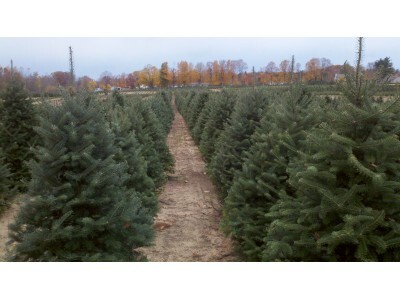 Here in Hartford, Michigan, we grow Fraser Fir, Canaan Fir, Balsam Fir, Blue Spruce, Douglas Fir, White Pine and Scotch Pine, and are always exploring options for new favorites. Because we have so many trees available at any given time, we’re confident that we can deliver your selection to you during the holiday season. Planting when the time is right. For every tree we sell in the winter months, we plant 1 – 3 seedlings to replace it. We’ll be measuring the rain, supplementing if necessary, and fussing over the trees all summer. They wrap up their growing cycle in mid-July or August, and we make sure they have everything they need. Preparing for the most wonderful time of the year. Our harvest season is a little different. Other farmers are harvesting their crops during the warmer months, while we’re still prepping. And when they’re planning out next year’s harvest, we’re in the fields finding the most fragrant fresh Christmas trees and greens for garlands and wreathes. Although we’ve got our differences, at heart we farmers are all caretakers of our land. Whatever the season, at Christmas Farms we have our eye on winter. We’re looking forward to spreading joy with traditional real Christmas trees.